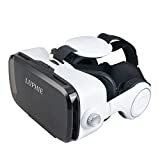 Introduction of LUPHIE VR Headset This new 3D VR headset is specially designed for 4.7-6.2 inches smart phone,it can be regard as your private 3D movie cinema ,There are three adjustable headband to ensure it can fit for most people,the maximum range of the headphone is approximately 4.92 inches which can ensure for different requirement. Usage Method First,you need to open the VR headset and then put your phone in it,next open the APP you download,insert the 3.5mm headphone cable line to your mobile phone.last wear it and enjoy the 3D movie. Features: 1.The 3D Glasses is made of ABS and spherical resin lens materials without stimulation plastic sheet that is environmentally friendly. 2.Dark cover can prevent light in which give you a good experience of 3D virtual reality. 3.Compatible with 4.7 to 6.2 Android and IOS Devices Package Includes: 1 x 3D Virtual Reality Headset; 1 x User Manual; 1 x Cleaning Cloth; Warm Prompt 1.Please search Google Cardboard or download other virtual reality APP in APP store. 2.Please choose HD videos or high-resolution mobile phone to watching 3D movies. 3.Please adjust the equipment well before you use it.If there's phenomenon of fuzziness , please adjust the pupil distance by the screw button at the top of the device to ensure the best viewing effect,there are two buttons on the two sides of VR headset,you can turn the buttons to adjust the most comfortable viewing distance. 4.The Headset should be calibrated before each use,.A virtual reality experience may trigger health reactions.because everyone may have different reactions when watching 3D image,if there are any dizziness happened,please stop using it immediately.we also suggest people do not wearing it for more than 2 hours,you would better to have a rest after you watch it for a long time.